It would be wise to say that, chassis number or vehicle identification number is an important marking for your Activa. It comprises of numbers from various factors, from the place of manufacturing by the company to the country/state of origin, everything can be derived from a chassis number. Not more than one Honda Activa can have the same Chassis number. The number comes handy when it comes to determining the age of the vehicle or even when you are required to report the police when your vehicle gets stolen. If you’re wondering about how to find Honda Activa chassis number location, then don’t worry. In this article, we’ll talk about where to find Activa Chassis number location with much ease. It doesn’t matter if you have a Honda Activa 5G, 4G, 3G, 125 & I, Chassis number is unique for every vehicle regardless of its model. You can know about the manufacturing month of a Honda Activa by just looking at a chassis number. The number is always 17 digits in length. Let’s say the chassis number for a Honda Activa is ME4JF505EGU035678 (for demonstration purpose only), now, the 9th character in the array represents the month of manufacturing i.e. A for Jan, B for Feb and so on. The 10th character in the array represents the year of manufacturing of Honda Activa. A stands for 2010, B for 2011 and so on. Always remember that chassis number never consists characters such as I, O & Q as they can be confused with 1 or 0 very easily. Where and how to locate old Activa chassis number? The 17 digit long chassis number of any Honda Activa can be found at the left-hand side of the vehicle near the crankcase over the oil strainer’s mounting. What if Honda Activa Chassis number is Rusted? It would be evident to say that, through a long period of time and constant exposure to moisture and heat, chassis number plate might attain rust. Even the Activa engine number might get diminish a little after a period of around 10 years. Well, in that case, if you require honda active chassis number rusted, you need not panic. Take a bucket full of water and soap and plastic bristle brush for scrubbing. Dip the brush in the soapy mix and scrub the region containing the chassis number gently. Let the water and soap do their cleaning action, use a cloth to dry the plate and check if the number is visible enough? Now, you’re required to repeat the process till you can clearly see the number. How to take the pencil print of Chassis number? Wondering about how to take a pencil print of chassis number of Activa? No worries, we’ve got your back. 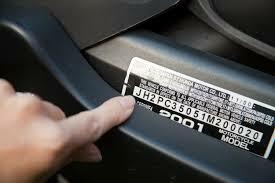 The first step is to locate the embossed chassis number. Once, you’re through, take a paper and pencil, sharp the pencil and take out the lead so that you’ve maximum lead drawing capability by just sliding. You can also cover your fingers with lead powder so that once the paper is on the chassis number, you can move your fingers over the same. Rub the lead pencil over the number once the thin strip of paper is positioned. Congratulations, you’ve successfully recorded the chassis number of your Honda Activa.